In the wake of Google Glass' failure, we can expect other companies to fill the void in due time. Perhaps unsurprisingly, Snapchat may be one of the first. 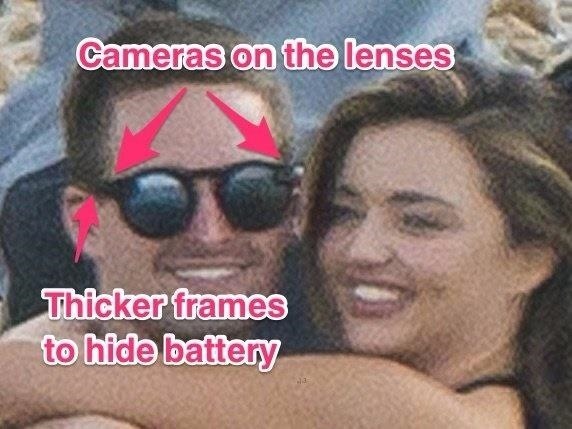 Business Insider recently caught Snapchat CEO Evan Spiegel out and about with a pair of stealthy sunglasses bearing a couple of surprising bumps. It's likely safe to assume those bumps are cameras and not a strange design choice given that Snapchat has demonstrated their hardware ambitions earlier this year. With GoPro and low-powered electronic hardware specialists working at the company, it's likely Snapchat plans to introduce their wearable tech sooner than later. While no one knows exactly what this new eyewear will amount to or how much it will cost, the stealthier look of the prototype certainly gives it a leg up over Google Glass' cyborg aesthetic. That said, if people see a camera anywhere there's still plenty of room for public distrust just like we saw with Glass. Whether or not photo-centric smart eyewear will entice consumers remains to be seen, but we have enough evidence from Google's missteps that you should definitely never wear them in the bathroom.